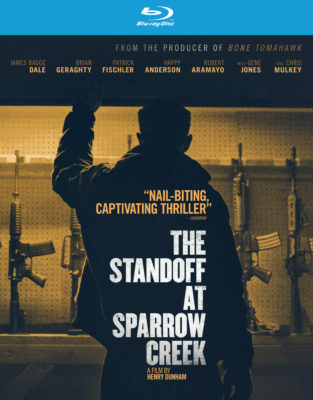 Henry Dunham’s feature film debut, THE STANDOFF AT SPARROW CREEK, is a tight ensemble thriller that moves fast while also raising questions about having well-regulated militias and making tough choices for the greater good. Its narrative echoes the likes of RESERVOIR DOGS or THE USUAL SUSPECTS, where the suspense is generated through character interaction and exposition. Seven men of a local militia chapter convene at their local headquarters, a lumber warehouse, when reports of an unknown gunman opening fire at a police funeral a few miles away hit the radio. Information that the gunman discharged an AR-15, flash-bang grenades, and was wearing body armor quickly have the men suspecting one of them was behind the shooting. Suspicions are confirmed when that equipment is found missing. No one comes forward to take responsibility. Without a smoking gun, the militia could be compromised – once local law enforcement begins a manhunt. Leader Ford (Chris Mulkey) entrusts Gannon (James Badge Dale), an ex-cop who left the force on bad terms, to start questioning members. Gannon’s experience in interrogation has him approach each member differently. But tempers start to flare, so does confusion and mistrust. James Badge Dale stars in ‘THE STANDOFF AT SPARROW CREEK,’ a RLJ Entertainment release. SPARROW CREEK begins with crackling gunfire that, from a distance, could be mistaken for firecrackers. That singular moment is the initial action of a story that examines the motivation for becoming part of a cause. These seven men – Ford, Gannon, Keating (Robert Aramayo), Morris (Happy Anderson), Noah (Brian Geraghty), Hubbel (Gene Jones), and Beckmann (Patrick Fischler) – are Anglo men of differing backgrounds, and their ages range from 23 to the mid-50s. Though writer-director Dunham doesn’t explicitly state why these men were drawn together to be part of this militia, each of them desires to be part of something bigger than themselves alone. Blame it on rising police states or fear of safety, these seven have a shared interest in maintaining a stockpile of weapons in case of crisis. Having conceived the story back in 2011, I’m sure Henry Dunham didn’t expect that gun culture and the right to bear arms would become such a hot-button issue. Shootings at Sandy Hook Elementary in Connecticut, Stoneman Douglas in Florida, the 2017 shooting in Las Vegas, and at a Aurora movie theater in Colorado, have had an effect in how a vast majority perceives guns and those who have access to them. THE STANDOFF AT SPARROW CREEK is presented like a play with small sets for a series of dialogue-driven interrogations. Words ricochet off rafters and kick up sawdust as the minutes tick. The line of questioning presents red herrings that all lead to an explosive climax. The film is a guessing game to the motivation. None of the men want to reveal a secret that would compromise their allegiance. The militia’s cause is greater than the individual. James Badge Dale – who is in a class of actors that flies under the radar but remains memorable, nonetheless – has a plum role. Just the way he moves and his inflection while interrogating is masterful. Like playing a game of a chess, he’s always trying to stay a few steps ahead. His past allegiance with the police makes him a man conflicted. Gannon’s conscience has steered him to this group; although, his patience faces many tests before finally succumbing to a chess move he didn’t see coming. The move leaves him in a stunned silence as we, like him, are left rattled when the fumes of gunfire dissipate. SPARROW CREEK is a well-made thriller that uses a plausible scenario to provoke fear. Coming from RLJ, the distributor that has released the bone-chilling works of S. Craig Zahler (BONE TOMAHAWK and BRAWL IN CELL BLOCK 99), Henry Dunham’s debut is another worthy addition to its library. Extras: It’s just a shame that in terms of special features, all that is on the disc, other than trailers before the main menu, is a mere 10-minute featurette that centers on the thoughts and reflections from the cast and director. Still, if you a want a thriller that uses words instead of bullets in escalating tension, definitely check this one out. THE STANDOFF AT SPARROW CREEK is now available on Blu-ray and DVD.